Arvind Kejriwal has not reacted to the corruption charge levelled by Kapil Mishra, a sacked minister. The allegation that Delhi Chief Minister Arvind Kejriwal received Rs 2 crore cash has been referred by Lieutenant Governor Anil Baijal to the anti-corruption branch of the police for investigation. 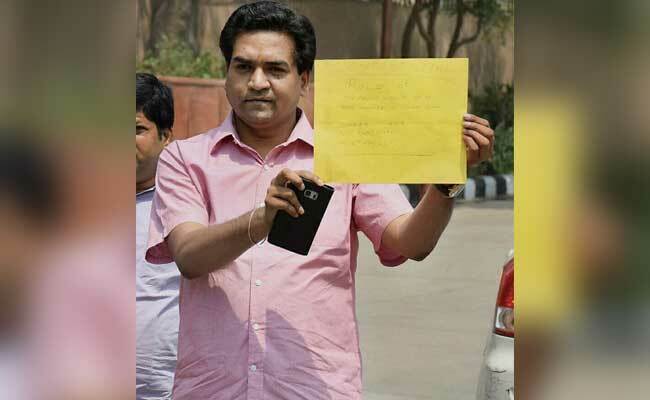 Kapil Mishra, sacked as minister by Mr Kejriwal on the weekend, went public with the sensational charge on Sunday. The Aam Aadmi Party (AAP) alleged today that Mr Mishra was acting on behalf of the BJP and making baseless allegations "out of desperation" after being removed. "Mishra is saying exactly what the BJP has been trying to allege. It is clear that the BJP is behind this. It's laughable," said the party's Sanjay Singh. Yesterday, Mr Mishra, 36, claimed he saw Mr Kejriwal receive the money from another minister, Satyendar Jain. He visited the anti-corruption branch or ACB this morning and told reporters he had shared evidence about Mr Kejriwal delaying an inquiry into a 400-crore tanker scam on the watch of the previous Congress government. He also said he would speak to the CBI about the cash deal. Kapil Mishra visited the anti-corruption branch and said he had shared evidence against Mr Kejriwal. The claim was not borne out by ACB chief Mukesh Kumar Meena, who denied receiving any complaint on the cash deal. The police officer was repeatedly targeted by Mr Kejriwal and AAP and labeled as "corrupt" in a history of acrimony over the years. Yesterday, Mr Mishra visited Mahatma Gandhi's memorial Rajghat before coming out with his big reveal, promised in several tweets. He alleged that he was witness to Mr Kejriwal accepting money on Friday and decided to raise his voice as "it was impossible to wait even for a day." He claimed he had drawn the Chief Minister's attention to "multiple instances of corruption" within AAP, including in political funding in Punjab, but was told by him "such things happen in politics". He also questioned what he alleged was Mr Kejriwal's "inaction" on his report on the alleged tanker scam during the tenure of the previous Sheila Dikshit government. "I have asked for a CBI probe. I want to say that (Arvind) Kejriwal, Satyendar (Jain) and I should go through a lie detector test," Mr Mishra said.